ICYMI: Burger King is testing the Impossible Whopper at its 59 St. Louis area locations, starting this week. According to the New York Times’ Nathaniel Popper, if the Impossible Whopper aces the test, Burger King is looking at expanding the new menu item nationally. Based on early evidence, the outlook is good. 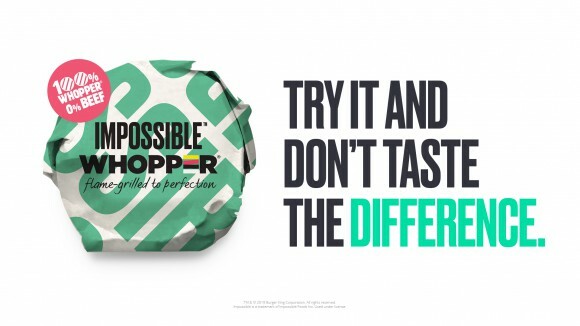 Impossible Foods is a leader in the movement to make plant-based meat that tastes, chews, and cooks the same as conventional animal meat. Too meaty for some vegans and vegetarians, Impossible Foods aims to satisfy flexitarians and die-hard carnivores. “People on my team who know the Whopper inside and out, they try it and they struggle to differentiate which one is which,” Fernando Machado, the chief marketing officer at Burger King, told the New York Times. This shift to creating plant-based meat that is edging closer and closer to indistinguishable from conventional animal meat—and that piques the interests of a broad consumer base—is what has drawn an increasing number of major chain restaurants to start experimenting with new plant-based options. Impossible has been widely available in slider-form at White Castle’s 380 locations since last year. Simultaneous with Burger King’s test run in St. Louis, Red Robin is adding the Impossible Burger to the menu at all 570 of its locations, making this (for the time being) Impossible’s biggest distribution partnership. Burger King’s 7,000+ locations would be a whopper of a scale up in production. Impossible has added a second production for the occasion. The Impossible Whopper is flame-grilled and served with the usual suspects: tomatoes, lettuce, ketchup, pickles, onion, and mayonnaise. The preparation is identical, right down to the sesame seeds on the bun. And the effect is clear: here’s the Whopper experience people know and crave—just with 90% less cholesterol and a comparatively minuscule environmental footprint.